I use two porcelain type clays, one for the cooler part of the kiln and the other for the hotter part. PORCELAIN is the purest and whitest of the high temperature clays. It is both the most sensuous to work with on the wheel because of its silky smoothness, and the most demanding: every action needs to be just so or it will flop. Fired to near its vitrification point, it is the strongest of the clays and promotes also the brightest and deepest glaze colour. In the case of high temperature WOOD FIRING, ash and flame markings are at once dramatic and subtle. I have developed my own porcelain clay body, and this ,with the excellent Southern Ice porcelain, are the basis for recent work. 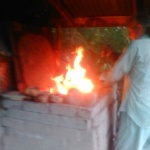 Pots are hand thrown on a potters wheel. I throw to as near the finished shape as I am able. 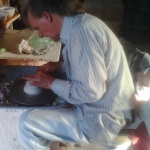 When half dry, pots are returned to the wheel for “turning” the final shape. That is, shaving back the surface with a sharp tool to more precisely define the shape wanted. Each piece is judged by eye and is a unique combination of curves that converge and diverge, of light and shadow. I glaze at just the right stage of dryness to ensure the best possible glaze fit. In a time consuming process, the MARBLED pots are carefully turned again to bring out their inherent patterns that would otherwise be clouded. They are also polished after glazing. 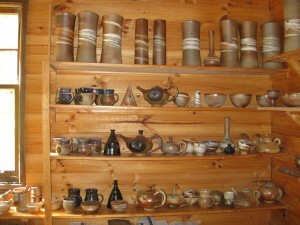 Pots are each glazed on the inside (with the exception of pestles and mortars). Clay slips are often applied to the exterior. I am careful to use all NON TOXIC materials. Colours, and quality, have been carefully tested in previous firings. There are glaze and clay tests in every firing to learn a little more each time and further refine results. 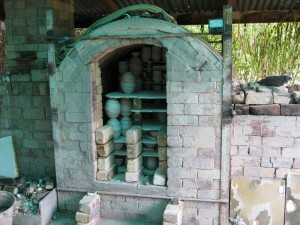 The kiln is packed carefully over two to three days to maximize the available space, to plan around likely flame paths and to allow for temperature and atmosphere variations. 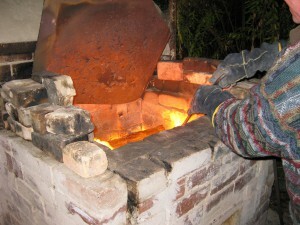 The firing itself involves a pre-heat the day before of about 9 hours with a small fire. The following day is up to 18 hours of constant attention. Different woods, because of chemical composition, have a significant effect on the colours and the ashing textures of the surface of the pots. In this case the sensuous licks and halos of green, violet, apricot, gold are from LOCAL trees. Wood is cut to fit the exact width of the firebox. It has to be split, stacked and sorted and as dry as possible before the firing starts. I start before dawn on the firing day. It is hard physical work throughout and the continuous anticipation of what effect actions will have ten minutes ahead. It becomes a type of meditation. I fire alone and become totally involved in the process. There is much to attend to at every stage of the firing. Sudden rises or plummets in temperature can occur if attention wavers. Patience, calmness, energy and clear thinking are essential. 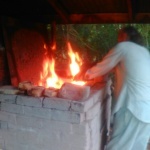 At the end, there is about a two-hour soak to peak at top temperature (1300oC), where the clay and glazes will mature evenly and the ashing and flame effects are maximized. This is a serene and special time, just the soft rumble of the kiln and the stars above. Choosing the exact moment to close down is incredibly hard to judge. It is a matter of experience and intuition. After a day and a half, the kiln has cooled sufficiently to have that first look. I never cease to be delighted and relieved to have gone fairly close to “just right”. Where the pot has rested in the kiln the base is likely to still be a bit rough. To ensure it is comfortable to hold and safe for all surfaces the base is finely sanded and cleaned of any residue. 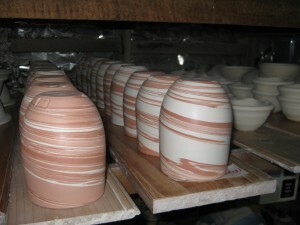 All pots are checked carefully for any minor cracks or other defects at this stage as well. 9. 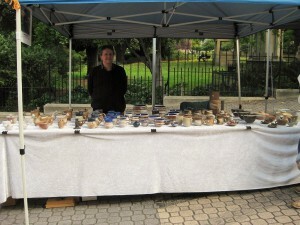 Most but not all weeks I have a stall at Salamanca Market, Davy St. end. 10. I now have a regular display of work at OFF CENTRE GALLERY which is open daily, Salamanca Arts Centre.at 77 Salamanca Place.